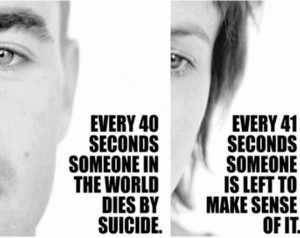 Two weeks ago, I found out that a young person whom I knew, and knew their family well, completed suicide. This person was someone that I had not had contact with for a few years, and I had no idea of the struggles that were present in their life. Yet, beyond the sadness for the loss of life, and for the person’s family, I felt a sense of remorse. I felt like there must have been something, anything, that I could have done to help that person. To let them know that people understand. That you are never truly alone or without support. When we lose a person to the act of suicide, there are many lingering thoughts and emotions for those that knew, and loved that person. One of the most common feelings seems to be guilt. As persons that experience the suicide death of someone they care about, guilt can show itself if we are, for example, estranged from that person. Guilt is common in survivors of suicide loss around the feelings of not knowing what was going on. It can be not knowing how badly someone that we love was suffering, or not knowing that they were suffering at all. Often those who survive blame themselves for their loved ones’ death. Another common emotion for loved ones can be disbelief. It be difficult to accept that a person in our lives has died, under any circumstances. Yet, with a completed suicide, that can be even more prevalent, as we don’t want to believe that someone that we knew and cared about would take their own life. It puts into question everything that we thought that we knew about a person. Who was that person, really, if they were something different than what was shown to us? That can be hard to bear. Another emotion, maybe harder for some people to admit to themselves and others, is anger. How could that person do this to me, we cry out? How could they leave me behind, cop out, have me deal with one mess or another? The person who has died, in these moments, can be viewed as selfish and uncaring about others. The truth is, in one way, suicide is a selfish act, in that a person is experiencing such intense emotional, and possibly, physical agony, that they cannot, nor do they want to, go on. They may be sick of themselves, tired of feeling alone, or tired of feeling like a burden to others. In that moment of intense pain, no other options feel feasible or relevant. They just want the pain, for everyone, to stop. As a person who has cared about persons who have completed suicide, I want to be clear in the words that I offer to others who have experienced this level of loss. When I am speaking on behalf of the Lou Ruspi Jr. Foundation, at a school or community event, I will ask those in the audience who have lost someone to suicide to raise their hands. It’s always several more hands in the air than I would like to see. And, I always tell them, that no matter what the circumstances of a person’s suicide, it is not the survivor’s fault. We want to make sense of something senseless, or have control in a powerless situation. Just know, that the hurt is real, anything that you feel is okay, and that, even when you feel like you are, you are never alone. Share the Journey: Local support group for family and friends bereaved by a suicide, for persons over the age of 16. Meets 3rd Monday of every month from 6:00-7:00pm at 1327 Wyoming Ave. Scranton. For more information Contact Kathy Wallace with Northeast Suicide Prevention Initiatives: 570-575-2343. or email at nspiinformation@gmail.com. Share the Journey Support groups for Friends and Family Bereaved by a Suicide. Mental Wellness Education has been our mission since 2012. With over 16,000 educated by our interactive LIVE presentations. Making a difference one school and one community at a time. Visit LRJFoundation.com and our Facebook page Facebook.com/LRJFoundation to Keep up to date with all the great educational initiatives happening in Pennsylvania and in Georgia!